Marisa Bast tracks her pop fly after connecting on a pitch. The senior infielder had 3 RBIs in the first game of the Wildcats’ double header. 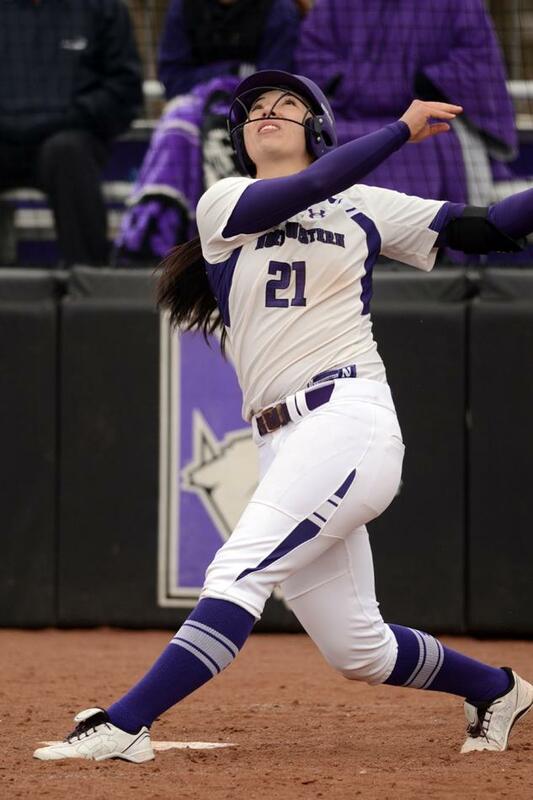 Northwestern made a quick turnaround from a weekend sweep over Indiana, winning both games of a doubleheader Tuesday at Illinois. The Wildcats (29-11, 11-6 Big Ten) used two solid offensive performances to defeat the Fighting Illini (19-23, 3-14 Big Ten) 6-3 and 9-0 (6 innings) in Urbana, Ill., and extended their win streak to six games. NU got the scoring going right away in game one. A first-inning single from senior outfielder Mari Majam, followed by a home run from senior third baseman Marisa Bast quickly made the score 2-0. Junior shortstop Anna Edwards then doubled with two outs and was brought in by a single from sophomore second baseman Brianna LeBeau to spot sophomore pitcher Kristen Wood a three-run lead. After Wood overcame a two-out single and error, the Cats added a run in the second. Majam drew a two-out walk and moved to second on a wild pitch, eventually scoring on a single from Bast. The hot streak continued in the third inning. After LeBeau was hit by a pitch, senior catcher Paige Tonz hit a double and junior pinch hitter Olivia Duehr drew a walk to load the bases. Junior infielder Julia Kuhn hit a grounder to third, and the throw home sailed over the catcher, scoring LeBeau. With two outs in the inning, a single from Majam gave NU its sixth run of the game. After Illinois made a pitching change at the start of the fourth inning, the Cats failed to register a hit for the rest of the game. The earlier runs proved to be enough, as Wood pitched a complete game, allowing 3 runs on eight hits and two walks. The second game of the series wasn’t quite as close, as the Cats were nearly perfect in all aspects. Freshman pitcher Nicole Bond had one of her best games of the season, pitching six shutout innings and allowing only one hit. NU got off to another fast start in the first inning with a triple from Allard and a sacrifice fly from Bast. Sophomore infielder Andrea Filler added another run in the fourth inning with a solo shot to center field. The Cats blew open the game in the fifth inning. After Duehr led off with a double, Illinois subbed in pitcher Jade Vecvanags, who had not allowed a hit in game one after relieving starter Brandi Needham. The Cats reached run-rule eligibility with a four-run sixth inning. Kuhn singled to lead off, after which Duehr reached on an error and Allard singled to load the bases with no outs. An error by Illinois against Majam and a two-run single from Bast made the score 8-0. LeBeau was then hit by a pitch and Tonz walked to make the game 9-0. Bond went one-two-three in the 6th inning with two strikeouts and a groundoutto put a stamp on a dominant performance. It was another huge series for Bast, who belted her seventh home run of the season in game one, giving her 37 in her career. Bast picked up six RBIs in the series and struck out only once. NU will travel to Columbus, Ohio, to take on Ohio State this weekend in its final Big Ten road series.